Snuggled away in privacy, this cozy cottage is situated on 7 acres of tranquility and mountain seclusion. Fly Fish, hike, enjoy the cool mountain air and take pictures of gushing water falls on the beautiful Tallulah River. If you are a biker, take a scenic ride to Hiawassee. If you are a hiker, everything from short hikes to the Appalachian Trail are nearby. How about white water rafting? Tubing? Antiquing! The open floor plan features a family room with vaulted beamed ceiling which magnifies the spacious room. In addition to the TV, sofa and recliner, there is plenty of room for a queen size futon that converts to a comfortable queen bed. Just a few steps away is a sizeable bath. Enjoy the splendor of a garden tub in the mountain fresh air. If you are tired of the galley kitchens in vacation homes, you will be pleased to prepare meals in this delightful kitchen that makes cooking a pleasure. Enjoy the luxury of real wood floors through out including the living area, bathrooms and bedrooms. Upstairs are two bedrooms. The master has an adjoining bath with brush nickle vanity facuets and separate toliet/shower area. A new 32 inch flat screen TV is mounted on the wall in front of the queen size bed and there is a deck off the master. Please note, however, there are steps to the master and loft bedrooms. Although they are few in number, they are a little steep. If you have issues climbing steps, this may not be the cabin for you. The guest bedroom loft area is quiet and airy with lots of windows to make a bedroom light and cheery. The prettiest views of the mountain and towering hardwoods can be seen from this room. This area is just off the master bedroom and overlooks the living area below. Twin beds are located here but one should remember this is officially a one bedroom, 2 bath cabin. Our rates reflect a one bedroom cabin. If you wish to utilize the twin beds or futon, you are welcome to do so. It works best for families. A huge screened porch runs across the front with a swing similar to Grandma's. The outside has a fire pit and BBQ grille with table. Just out the door are 7 acres of privacy and down the hill is the Tallulah River which borders a forest service wilderness. Although the river is approximately a mile away, you will probably want to drive to your favorite location for fishing, hiking or swimming. There are beautiful hiking trails, waterfalls and great trout fishing year round. All of this is located minutes from Lake Burton, Tallulah River, Appalachian Trail, Tate City, Persimmon Valley, Persimmon Creek Winery, Helen, Clarksville, Lake Rabun, Lake Seed, La Prades Marina, Moccasin Creek State Park and Black Rock State Park. Don't forget the HIGHLANDS, Dillard,Franklin,and Cherokee are a short day's drive. If you like playing golf in the cool mountain air, there are numerous golf courses in the area. Travel 85 North to 985, 441 North to Clayton, Georgia. In Clayton on E. Savannah Street/US-76 West , travel 76 West. (toward Hiawassee) 7.9 miles. Turn right on Persimmon Road, travel 4.2 miles. Take the lst Left on Trickle Creek Trail. Travel .06 miles. Small yellow sign. 129 Trickle Creek Trail is on the left. The only way you can go on Trickle Creek is left. Make a sharp left. Travel down the hill and then up the hill about 1/4 mile to the first cabin on the left. (It is not the cabin at the bottom of the hill.) Address is 129 Trickle Creek. A sign is attached to a tree on your right indicating the Aunt Nell's Cabin. Paved Roads all the way to the cabin. Suggestion: Copy, paste, print these directions and take them with you. Arrival Time: 4:00 PM- before dark is preferred. If you like elegance and relaxation, this one is for you. If short stairs to the bedroom are a challenge, it may not be your 'cup of tea.' If fly fishing and hiking is to your 'likin' ', it will be a paradise. Come to our place and enjoy the solitude of Mother Nature. Please submit information on line call to make your reservation. Please call witih credit card information for payment. Thank you. Sorry, not pets and no smokers. Stickly enforced. If you are interesting in reserving the cabin, please follow up with an email to carolaowen@comcast.net. I cannot access VRBO website when traveling; hence I am unable to reply in a timely manner. My profession requires weekly travel. Thank You. Michael and Carol Williams, reside in Peachtree City, Georgia. In spite of our many travels through out the world, one of our favorite areas is the Northeast Mountains of North Georgia. Our cabin is located .5 miles from the Tallulah River and is truly one of the most beautiful locations we have ever visited. Aunt Nell's cabin is named after my Aunt Nell and it houses some of her most treasured furniture. One is surrounded by Mother Nature and beauty there and it is the place to go to get out of the 'Rat Race' of a busy working environment. Mike is retired now and I am still flying as a flight attendant for Delta. We Purchased Aunt Nell's Cabin for it's serene atmosphere and for it's cool crisp nights during the summer heat. Fall is a sea of crystal warm colors and spring sports the blooms of mountain laurel hovering over the rush of water falls on the river. The ride along the River displaying its clear water of trout and waterfalls is a must. Aunt Nell's Cabin sits on 7 areas whereas you can hike, fly fish or simply relax on the deck with your favorite book. The location is perfect for day trips to other areas without having to rent other hotel rooms. It's cozy decor gives you the sense of home if you wish to stay home and enjoy TV or make your favorite meal. There are two bath rooms. One on the upper deck and one on the lower level for your convenience. Both are full baths and one has a lovely garden tub to pamper yourself after a full day of hiking. 2 full baths. Master bath is on the upper level with steps in shower. 2nd full bath is located on lower level with garden tub/shower. 7 acres surrounded by a privacy of hardwoods located very close to the Talullah River. Land line for local and long distance. Yes, there is an air conditioner. Wall Unit in downstairs and window unit in upper master bedroom. Electric Wall Unit, Baseboard heat. Queen bed with standard pillows. Twin with standard pillows. Additonal queen futon if you wish to bring your own linens for futon. No, but one may park near entry door. Wi Fi. Security code posted in cabin. One bath, One hand towel and one face cloth per person. 6 towels. Please bring additional towels if you need 2 per person or if you wish to carry them to the Lake or river. Gas Logs with limited propane. One sofa, one recliner, futon, flat screen TV. Good lighting. Vaulted ceiling with exposed beams/ciling fan. Lots of windows. Open to Kitchen. Large refrigerator with ice maker. New appliances including built in microwave and Bosch dishwasher. Fully Stocked. Has coffee maker. Limited paper items. Place mats and hot pads provided. Nice Table. Please use hot pads on table. Located on shelves in Living Room. Obtain at your own risk. A limited number of DVDS available under DVD in cabinet. Accessible to lower level with queen futon and full bath. Non accessible to Master Bedroom. No gravel roads. All paved roads to the cabin door steps. There is a secondary gravel road with a gradual incline to the cabin. It is an optional approach from Tallulah River Road, It is the first red gate on your left after you turn off Persimmon onto Tallulah River Road. You are welcome to use this gravel road and cross the lot with the flag pole. You may also hike and wander around this area since it is part of the 7 acre tract we own. Thank you for the review. 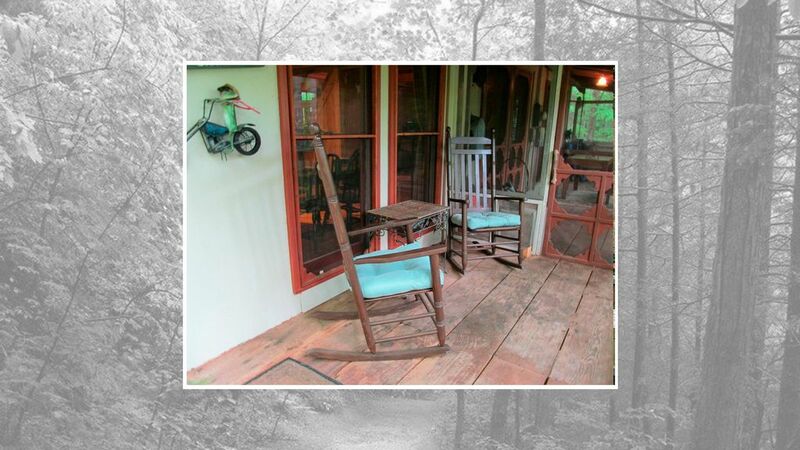 Yes, if you are interested in quiet time, away from the city life noise, this cabin provides a calm atmosphere with lovely towering hardwoods and the Tallulah River just down the hill. Yet, the city life is a short 20 minutes away. We look forward to seeing you in the Spring. Thank you for staying with us. Enjoyed our stay. Cabin is convenient to several great attractions. The property is a great get away Location, while very convenient to local attractions. Our stay was very pleasurable with all the creature comforts of home. We would recommend this property for privacy, cleanliness and convenience and would enjoy staying again. Thank you for taking the time to post a review. We appreciate your noting the cabin cleanliness as housekeeping works very hard to maintain such. We are honored you would stated you would return. Repeat business is always appreciated. Yes, the cabin is located to many local attractions with the convenience of the Tallulah River within a mile. We had a great time. Highly recommend for a quaint leisurely getaway. Owners are very accommodating and are attuned to renters experience. Cabin is ideal for a true Appalachian trip. The cab is as all 5 start review mentionet , for 4 fisherman , it had everything we needed ,( as we usually tent camp there ) there was nothing we neaded that wasn’t there. The owners were very nice & easy to work with . We ask for a late check out to fish the last morning & without hesitation approved. Already planning another trip. ( could see that it would be enjoyable to just hang out there at cabin to , as we stayed in the water fishing ) Thank you for a wonderful time. Thanks for staying with us and thank you for the nice review. We are thrilled you loved the convenience of Aunt Nell's Cabin to the beautiful river. Many of our guest report they never leave the area. So much to do right there with hiking, swimming and fishing. We look forward to your return. What else can I say? I love Aunt Nell's Cabin on the Tallulah River. I have been going there since I was 12 years old- 47 years now. Too old to sleep on the ground now but I can continue to enjoy the river and have all the amenities of home at Aunt Nell's. Carol is an awesome owner and will do everything possible to accommodate your stay. Many of our guest tell us how much they love this part of the river and how they enjoy the luxuries of a comfortable bed and a hot shower while continuing the fish, hike, and take photos of the river. We love having these guest stay with us and we look forward to their return. A secluded gem, super comfortable! The Tallulah River is approximately .75 mile down the hill from the cabin. It offers excellent fishing, hiking, scenery, photography and painting. Black Rock Mountain, located between Clayton and Dillard offers the prettiest views in Georgia. Helen is approximately 45 minutes away with River Tubing and Hot Air Ballooning. White Water Rafting, and Live Music Festivals are approximately 45 minutes. The best Antique shopping and the famous Dillard House are in nearby Dillard. Please note I may not be able to call back immediately due to my flight schedule. Email me at carolaowen@comcast.com to ensure I receive notice of your desire to rent. Due to VRBO security measures, I cannot access VRBO web site when traveling. Also, please contact me by email or text if you need alternate payment plans. Thank You.